Foodie and recently graduated Phoebe Damrosch was not sure what to do with her life. She managed to casually pursue some avenues in her life such as applying to a handful of graduate programs. Mostly, however, she waited for inspiration if not an epiphany about what course to pursue. Her interest in food led to a job in bussing tables where she found the energy of restaraunt life suited her. Then, the epiphany came in a fateful meeting with superstar chef Thomas Keller of the famed Napa Valley eatery French Laundry. Keller's restaraunt Per Se would soon be an instantly legendary New York establashment. 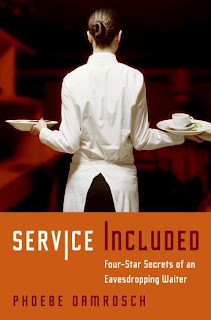 Ms. Damrosch would find herself as one of the waitstaff of the most talked about new restaraunt in the US. The result of this is her first book, Service Included (William Morrow), a work reminiscent of fizzy classics such as Breakfast at Tiffany's. Ms. Damrosch was nice enough to speak to MLF about her book. (On a personal note, I have been lucky as a journalist to mostly have good co-operation from individuals I have interviewed. Ms. Damrosch, however, has been the best and most co-operative individual I have ever interviewed0. would make a good book? your experiences would not make a good book? the whole book. You can�t please everyone." or just as neurotic as any other workplace? and doing it all over the next day." were working on the final draft? it to be when you were writing the book? but the design department knows what they are doing." differences between being a male and female waiter? PD: "I will speak for myself so that I don�t get in trouble. with a woman. It's sexist, but true." money and more from our appearance and sexuality. untrained and uninspired staff alienates the guest." to eat when you get off work? and it helps to be well taken care of."